Product Close-up Visit the Beth Moore Shop! 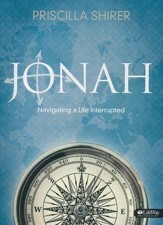 This member book accompanies the Anointed, Transformed, Redeemed: A Study of David group study. Taped at the 2007 Deeper Still event, Beth Moore, Priscilla Shirer, and Kay Arthur explore the life of David. These authors' messages are divided into three segments, two lessons each. Each segment focuses on the life of David at a different stage of his life: as a young man (by Priscilla Shirer), as a middle-aged man (by Beth Moore), and as a man facing the final third of his life (by Kay Arthur). The member book provides six weeks of interactive, in-depth Bible study and includes group leader helps. 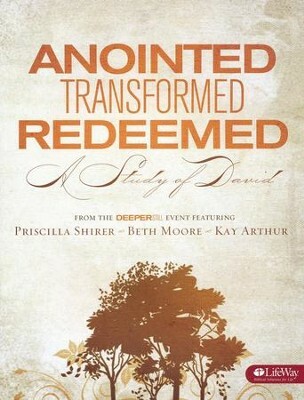 Anointed, Transformed, Redeemed: A Study of David - Bible Study Book provides the participant experience for the women's Bible study taped at the 2007 Deeper Still conference featuring Beth Moore, Priscilla Shirer, and Kay Arthur. These three women explored their lives and the life of David in this six-session Bible study. The messages presented by these beloved authors are divided into three segments, two lessons from each author. Each segment focuses on the life of David at a different stage of his life: as a young man (sessions one and two by Priscilla Shirer), as a middle-aged man (sessions three and four by Beth Moore), and as a man facing the final third of his life (sessions five and six by Kay Arthur). Youll laugh with them, cry with them, and learn to love God with them. Es escritora y maestra de libros y estudios bíblicos que han sido éxitos de librería, y viaja por todo Estados Unidos dando conferencias. Esposa y madre dedicada de dos hijas adultas, Moore, vive en Houston, Texas, donde es presidente y fundadora del ministerio Living Proof Ministries. Is a writer and teacher of best­ selling books and Bible studies whose public speaking engagements carry her all over the United States. A dedicated wife and mother of two adult daughters, Moore lives in Houston, Texas, where she is president and founder of Living Proof Ministries. Priscilla Shirer, maestra de enseñanza bíblica y conferencista, tiene un diploma de Master en Estudios Bíblicos del Seminario Teológico de Dallas. También es reconocida como escritora. Entre sus libros se incluye Uno en un millón, Interrupción divina y La resolución para mujeres, este último incorporado a la lista de títulos exitosos del New York Times. También actúa como personaje principal en la película "Cuarto de guerra" (War Room). Priscila está casada con Jerry Shirer, con quien fundó el ministerio "Going Beyond". Tienen tres hijos y viven en Dallas, Texas. Priscilla Shirer is a Bible teacher and conference speaker with a Masters degree in Biblical Studies from Dallas Theological Seminary. Also a popular author, her books include the New York Times Best-Seller, The Resolution for Women, One in a Million, and Life Interrupted. She is also the lead character in the War Room movie. 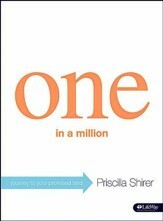 Priscilla is married to Jerry with whom she founded Going Beyond Ministries. They have three sons and live in Dallas, Texas. 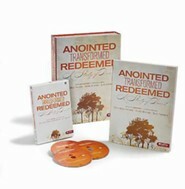 I'm the author/artist and I want to review Anointed, Transformed, Redeemed--Member book.